With construction work well under way, Phoenix Place is still on schedule for completing in August 2018. Steel work did get slightly delayed due to high winds at the site, however the steel work is now completed on both blocks of the development. 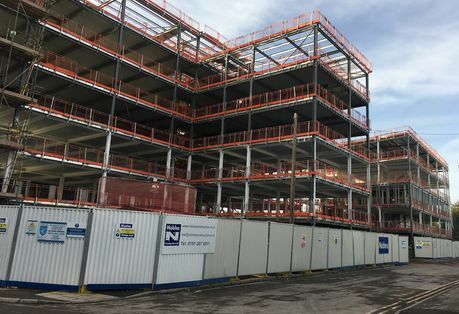 The steel work, floors and stairs have all been completed and installed on block one, with the roof decking due to be completed within the next few weeks. Likewise, the steel work, flooring, stairs and roof deck all completed on block two. The blockwork to the lift shafts and SFS were due to commence at the being and mid-November. Phoenix Place is situated next to the £150 million Project Jennifer scheme, which is set to create a new district in the North of Liverpool. Building work is due for completion, meaning people can start to see the project transforming. If you would like more information on Phoenix Place, call +44 (0) 161 337 3890 or email enquiries@hopwoodhouse.com to speak to a member of our consultants’ team.